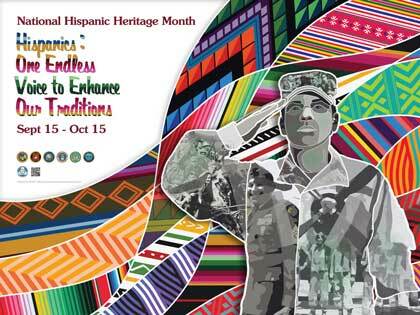 WASHINGTON (NNS) -- The Navy observes National Hispanic Heritage Month, Sept. 15-Oct. 15, highlighting the histories and accomplishments of Americans from Spanish-speaking areas. As of June 2018, approximately 59,000 active and Reserve Sailors of Hispanic heritage serve in the U.S. Navy contributing to the strength of the nation’s force. Hispanic Americans’ military service dates back to the Civil War. One well-known example is Jorge Farragut who was born on the Spanish island of Minorca and joined the South Carolina Navy in 1779. Remembered as one of the first Hispanic Revolutionary War heroes, he was instrumental in securing a Union victory in New Orleans on April 28, 1862. When Adm. Farragut died in 1870, President Ulysses S. Grant led 10,000 Soldiers and Sailors through the streets of New York during his funeral procession. Several members of the Hispanic community — military and civilian — have significant contributions toward protecting the nation and embodying Department of Defense values. Sixty people of Hispanic heritage have been awarded the Medal of Honor, two were presented to members of the Navy, 13 to members of the U.S. Marine Corps and 46 to members of the U.S. Army. USS Rafael Peralta (DDG 115) was named in honor of Navy Cross recipient Marine Corps Sgt. Rafael Peralta who was killed in Fallujah, Iraq, in 2004. An Arleigh Burke-class guided-missile destroyer, Rafael Peralta was commissioned in a ceremony at Naval Air Station North Island in July last year. Peralta, who was born in Mexico City, Mexico, immigrated to the United States with his family. He joined the Marine Corps in 2000, after receiving his Green Card. Peralta was awarded a Navy Cross, the country’s second highest military award, subsequently. The tradition of observing Hispanic heritage began in 1968, when President Lyndon B. Johnson designated a week in mid-September as National Hispanic Heritage Week. Twenty years later in 1988, President Ronald Reagan extended that week to a month-long observance. The heritage month’s dates refer to Independence Day anniversaries of Latin American countries – Sept. 15 is the anniversary of independence for Costa Rica, El Salvador, Guatemala, Honduras and Nicaragua. Mexico declared its independence Sept. 16, and Chile Sept. 18. The Navy is strengthened by the diversity of its force as it underlines that patriots of Hispanic American Heritage continue to build legacies of freedom and diversity as they fight for the security of the country and the peace of the world.